Jumping over the moon is no easy task. Oh no, Cow needed to do lots of training and made multiple attempts before succeeding. Her efforts are encouraged and praised by her supportive friends, the cat with the fiddle, the little dog, the dish and the spoon. Will she be able to achieve her goal and make it over the moon? This hilarious picture book offers a new perspective on the well-known nursery rhyme. It contains a powerful message of perseverance and determination which will be valuable for anyone learning a new skill. This book may be especially helpful for children who avoid tasks that they deem to be too difficult. After all, nothing can be harder than jumping over the moon! The lyrical text is clear and repetitive, making it perfect for promoting language development and easy for young readers to read on their own. I love using this book to work on prepositions as we follow the cow’s many mis-jumps and wrong turns during her training journey. This is a great book for describing a character’s plans to reach a goal, as well as identifying the obstacles that get in the way! The humorous illustrations provide plenty of opportunities for children to draw inferences about the story. 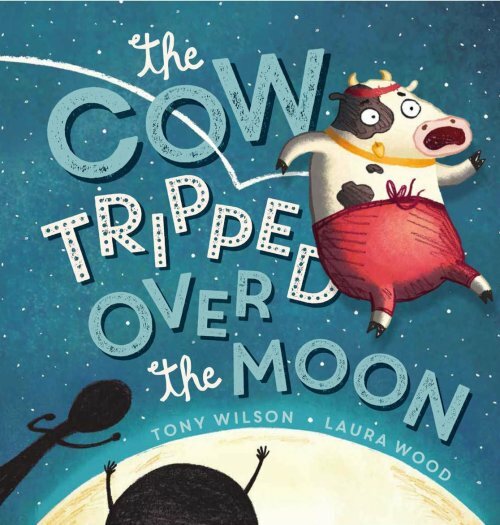 For further speech and language targets in The Cow Tripped Over the Moon, see the list below.